Did Jennifer Lopez break-up Ben Affleck and Jennifer Garner's marriage? 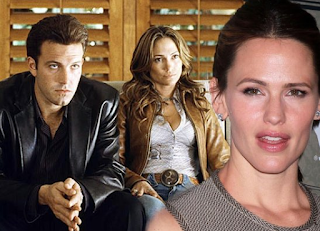 Fans were saddened when Ben Affleck and Jennifer Garner confirmed they were filing for divorce after ten years of marriage this week. And a new report suggests their split could have been fuelled by Jennifer's alleged concerns the Argo star had been growing closer to his ex-fiancée Jennifer Lopez over the last few months. According to The Sun, Ben and J.Lo - who dated for 18 months before calling off their engagement in January 2004 - have been in regular contact since reconnecting at the Oscars this year. A source told the paper's Dan Wootton and Pete Samson: 'Everyone is talking about J.Lo and Ben and saying it's inevitable they will get together again at some point. 'They were pretty flirty sat the Oscars and have stayed in touch via email. Jennifer Garner never liked it.' However, a reconciliation seems unlikely since Lopez is thought to be back with her boyfriend Casper Smart.